Deburring of cut surfaces not only protects the operator from injury when handling the cut pieces, but also assures better fitting during assembly, uniform quality, and better appearance. Burrs are removed from both ends simultaneously with tubes being deburred on the I.D. and O.D. Interchangeable support rails enable the deburring of shapes, squares, and rectangles. Simple adjustments are provided for different tube sizes and different lengths. Interlinking with an automatic sawing machine assures high production with minimum operator attention. Standard deburring lengths of 40", 80", and 120" are available. 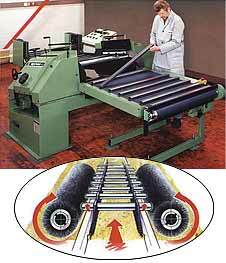 The deburring machines can also be interlinked with washing and drying machines. 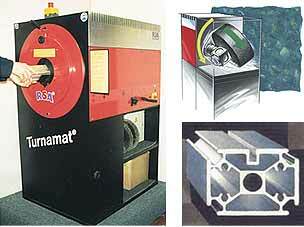 The Turnamat is designed for end deburring of steel and non-ferrous cut pieces. The tubes or shapes are manually held in a self-centering device. Average deburring time is 1 to 5 seconds. Can not view this PDF? Download the PDF Reader from Adobe.